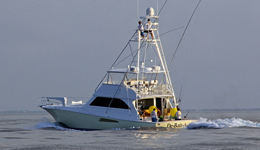 KEY WEST, Fla. – Slick calm seas and little wind greeted 71 excited competitors on the first day of the World Sailfish Championships in Key West. The key, it turned out, was waiting until the last 10 minutes to make your move. That’s exactly what De-Bait-Able and High Standards managed to do, catching their tournament-leading fourth fish, respectively, with four minutes to go and one minute into overtime. De-Bait-Able is leading the tournament based on the fact they released their last fish first (at 3:26 p.m.), while High Standards was hooked up but didn’t release their fourth fish until 3:31. Adler and his crew Mike Walsh, Billy Walsh, Mike Lanigan, Jay Lanigan, Eric Soderholm, K.J. Zeher and Nick Zeher, resorted to sight fishing just to stay in the game. After battling to get their kites to stay up – “aggravating”, as Adler put it – they started looking for free jumping fish. Adler said his fish were caught when the crew spotted jumping sails and were able to cast their baits right to the fish. During the day, however, even putting a bait in the fish’s mouth didn’t seem to help. That was the key to the last 10 minutes for De-Bait-Able and it’s final two sailfish. Those two would have given Adler and his 65-foot Viking the outright lead except High Standards with captain Nick Carullo at the wheel were hooked at 3:30, the official lines-out cut-off. Because High Standards was already fighting a fish at that time they were allowed to continue. They released that fish at 3:31 and tied Adler and his crew for the lead. For the day, 71 boats released 66 fish. The Edge, led by captain Chris Leon, recorded the first release of the day about a half hour after the official lines-in time. While De-Bait-Able and High Standards get to sleep on the lead, they are being closely pursued by a slew of boats, including a bunch of seasoned competitors. Tied at three releases are Wound Up, Cool-CAT, Rock Star, Viking 64, Miss Britt and Predator. Conditions for Day Two look to be the same as Day One, meaning the competitors can expect just as tough of a day on Thursday. 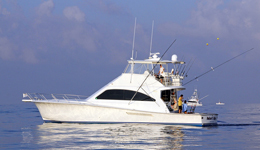 Keep checking OutdoorChannel.com for our continuing coverage of the World Sailfish Championships!